led by a trained teacher who inspires everyone to join in the fun. Explore the different programs offered at Mo Music below to find the best fit for your family. Then sign up to visit a class free and experience it for yourself! For infants through 5 years of age and their grownups. Join us in discovering an informal and non-judgmental setting in which children and adults sing, dance and improvise together. We will joyfull fly with rainbow wings, stomp like elephants, make a rainstorm with our drums, chug as a train, and curl up for a lullaby. 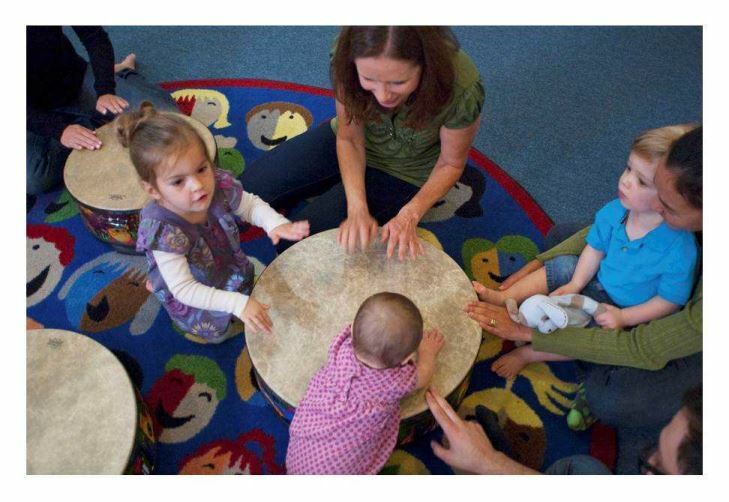 • A community of families sharing songs, playing instruments, and exploring rhythm and movement. • Playing with egg shakers, rhythm sticks, triangles, drums, resonator bells, balls, parachutes, and more! • Music experienced through age-appropriate, research-based activities that support and respect the individual learning styles of very young children. • Children of mixed ages growing together, as the older ones become leaders and the younger ones delight in watching their bigger friends. • A new song collection every ten weeks, featuring colorful arrangements of original and traditional songs in a wide variety of musical styles. We also offer a Music Together Babies Class for infants under 8 months, which opens up the world of music-learning for your new little one. Learn to play musically together with your baby. • A group of children exploring musical concepts through circle singing games, dancing, chants, improbisation, and instrument play. What is covered in the lesson?